July | 2015 | Where in the World is Andy? Where in the World is Andy? A Peace Corps Volunteer's Namibia service. The Official Language in Namibia is English. For those of us originating from the USA or other English speaking countries, the reason for this choice can seem obvious. There are, of course, different “obvious” reasons for different individuals, but obvious is the feeling of the observer based on their own experiences and predispositions. Many of these predispositions deal with some feeling of English being superior in some way. Personally, I think that’s an experience-centric viewpoint, kind of like thinking the Earth is the center of the Universe. So let’s take a look at some facts. Not to imply that different languages do not have some clear advantages over others in certain circumstances. Namibia became independent in 1990 – we are in the 25th year of being an independent country. I’ll write about that event, and the country situation today, in a future blog. But for now, realize that English was NOT the primary language in 1990 – not by a long shot. It was pretty minor, in fact. Still is (as a household language). So why English? Preface (is that still possible in the third paragraph? ): I am FAR from an expert in Namibian political decisions, or in anything else Namibian for that matter. However, I know more being here than I did in the USA, and I’m giving my impressions and learnings at this stage. The potential “true” story is still unfolding for me. Meanwhile, see the “Disclaimer” page in the menu at the top! In starting to explore languages in Namibia, it’s important to realize that what we think of in the USA as “Race Relations” exists here also (I’ll write about that in the future), but it’s more like Tribal Relations. In the USA, Race Relations usually has to do with the color of your skin: black, white, brown, “yellow” (I never did understand that one), mulatto, or whatever. Here, there is some degree of black/white/shades that’s only sometimes easy to see, but the Tribes aren’t so much different colors as they are different traditions, different cultures, different areas of origin, etc. and the majority of them are black, or some shade of what we people from the USA call black. People from different tribes don’t always get along all that well, and for sure have tribal prides and prejudices. To try and give you some idea of one realization that has slowly permeated into me, the last sentence in the previous paragraph serves as an example. I originally wrote “Nonetheless, people from different tribes don’t always get along all that well, …” Note the word “Nonetheless” that just flowed out while I was writing. That wording seems OK, but if you think about it, the underlying belief/assumption on my part was(is?) that they SHOULD get along because they are all, ummm, black. “Nonetheless” means “in spite of” (kind of) some other thing that would imply otherwise. Maybe skin color isn’t as important to race relations as I used to think it was? So I changed the sentence to reflect “what is the case”, without the subtle underlying assumption on my part. Being here has raised my awareness of needing to recognize unstated assumptions that may be, but often are not (like in this case), valid. I’m going to write about tribes later. For now (while concentrating on Languages) I’m just going to list some, not all, of the tribal groupings that have a history and presence in Namibia. In no particular order, there are 13 ethnic groups: Herero, Damara, Nama, San (Bushmen), Whites, Caprivian, Kavango, Topnaars, Tswana, Himba, Owambo., Basters, and the Coloureds,, These last two are full of innuendo for our western sensibilities, and for good reason based on the culture I grew up in decades ago when “Coloureds” was an accepted, but negative, term in many parts of my country. Now, “Coloureds” is a term that is just not OK in the USA. But in Namibia it is not at all charged, it is simply the name of a tribe of people originating in the area that is now known as South Africa. Same with the Bastars, which sounds uncomfortably close to the western “bastards”, a derogatory designation. Again, not here – it is simply a tribe. While there is some historical basis in both the Bastars and the Coloureds evolving from racial mixes a long time back, the negative connotation we have in the USA just doesn’t exist here to any significant degree. Some individuals, of course, are exceptions. Think of this as an exercise in really understanding that people don’t always think the same way. “Leaving your preconceptions and prejudices at the door” isn’t so easy when we don’t even recognize that we have them. I wrote “Nontheless” without even thinking about it. Here is a map of some of the major ethnic groups in Namibia. Given those major ethnic groups, let’s talk about language, now. Oshiwambo (7 or 8 sublanguages), Otjiherero, Kovango languages(5 of them), Afrikaans, Caprivi, and Khoekhoegowab are groups of languages spoken by at least 5% of the population. Most of them have multiple dialects that are actually different languages. Note that English is not on the list. That’s because only about 3% of the population speaks English at home. Less than that in 1990. But it’s the national language? Read on. Other relatively important languages (even though less than 5% of the people speak it at home) are: English, Deutsch(German), Dutch, Portuguese, Setswana, and the “Bushman” languages (five of them). Depending on where you look, there are somewhere around 13-30 (or more) significant different languages spoken in Namibia, with a current population in all of Namibia of about 2.2 million. 60.5% of Californians speak only English (Arguably the native language to California residents, and only if we don’t look back farther than 200 years). Armenian, Japanese, German, and Persian 0.5% each. Note that the other languages are all from non-USA countries (although English was one of those 200 years ago. One other interesting fact. The list above (from a prominent web site) doesn’t list the native American language AT ALL! If you add up the “another language” group that comprises 39.5%, it is short 5%. Which means that 5% of the residents speak something other than English or the languages listed. Ie: Native American would be in this 5%. From http://linguistics.berkeley.edu/~survey/languages/california-languages.php, note that there are/were 76 (yup – seventy six) Native American languages spoken in California. Hang on a minute: Did you notice the last bullet, above? TEN (10) of the language of the top 13 in Namibia (2.2 million people) are indigenous African/Namibian languages. Compare: ONE of the languages (English) in California (half of the land mass, 39 million people) is only arguably indigenous if viewed within a 200 year window. Hmmm. How can you compare the USA language experience to Namibian? While the dialects are significantly different (enough that they are considered a separate language), one can understand the other when they are in the same group. For instance, I am now learning Oshikwanyama, and can be understood by (and eventually understand) Oshi…., all of which are considered Oshiwambo languages. However, when two people are speaking to each other from a subgrouping of Oshiwambo, they most likely will speak their own language in reply to the other person’s language. It becomes a lively/normal discussion where the two people are using different languages! This is not unheard of in European languages of course, but it is a daily, normal, and unremarkable event here. Situation normal. When I mention it to some of the women here at Penduka, they look at me as if to say “yeah, so… I don’t get your point?” It’s kind of like saying air is transparent. Doh. Namibians are virtually all multilingual. It is the norm here for a Namibian to speak at least three languages: Their native (home) language, English (learned in schools and on the job/in life), and Afrikaans or an Oshiwambo language. This doesn’t mean a few words in other languages, this means conversational fluency! Many, many Namibians speak four or more languages. A small percentage only speak two languages. I have yet to meet anyone, or hear of anyone (native to Namibia), who speaks only one language – with the possible exception of some of the San Bushmen who live in extremely remote rural areas. As an aside: I, and probably all of you, have been aware of “click” languages on TV programs from Africa. The San Bushmen (in the movie “The Gods Must Be Crazy”) spoke with clicks being a part of the vocabulary. It always seemed odd to me, and I know it was to many others. I’m actually getting used to it, here. It is not only not rare, it is everywhere, and is part of the “Khoekhoe…” (pronounced kwe-kwe”) language group. It is also very common with the Damara/Nama language(s). I’ve almost stopped noticing it – almost. Back to English as the national language. When the country was being formed (only 25 years ago, remember!) one of the more significant issues they faced was how to transact national business and politics. If they chose one of the native languages, they would irritate the language groups not chosen. So, they chose an uncommon (for the country) but common (for the world of business and international politics) language: English. I suppose a cynic would say then everyone was equally irritated – but it’s worked well, if imperfectly, so far. There are very significant challenges to educating the children in English, but the efforts continue and English is, in fact, widely spoken in the country, now. By the way, my explanation for the choice is not any kind of “official” explanation, and might be argued against by any number of people and sources – possibly roughly the same number that would argue that it’s accurate. But who knows. The plethora of Languages is one of the most difficult challenges the country faces. And that is not a contentious opinion. I spent two months learning Afrikaans in Peace Corps training, but found it to be almost useless in my current site even though it will be very useful in the country as a whole (particularly southern Namibia) over a prolonged period of time. So while continuing studying Afrikaans with a tutor, I’m also starting to learn Oshikwanyama (also with a tutor) which is very useful in the North of Namibia. Where I live, at the “lodge and craft” location of my post, there are (roughly) three Afrikaans speakers, 12 Oshiwambo speakers, 7 Otjiherero speakers, and a smattering of Damara/Nama, Khoekhoe, and others. But they ALL speak 2-4 languages, and the vast majority has some useful English, many are quite capable in English. Plus there are 6-7 deaf women, so sign language also has to be mixed in there at least for this post. That’s all on languages for now. The “Bottle House” – that’s what everyone else calls it. To me, it’s home for the next two years, maybe more. The walls are made of rows of beer and wine bottles, laid side by side and alternating necks and bases by row. The space between is filled with a clay/concrete mixture that is hard and pretty durable, but crumbles fairly easily with directed effort. Turns out homes and other smaller buildings made of recycled materials are fairly common in Namibia (and elsewhere). 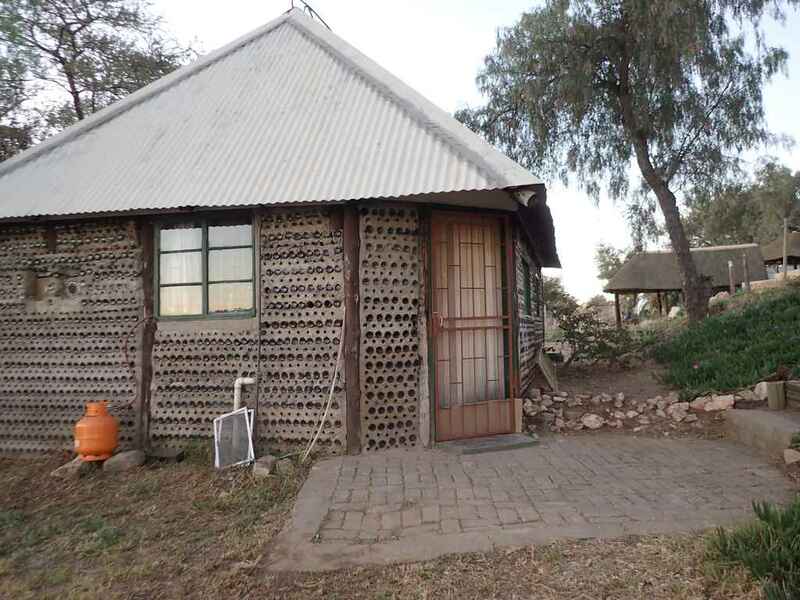 Several visitors have commented on seeing buildings made from beer/wine bottles and clay or concrete throughout Namibia, particularly in the rural areas. This one was built in 1999, and I coincidentally met a Dutch man last weekend that was here, then, and helped construct it! He is away this week, but will be back mid-week and we plan to get together and get to know each other before he returns to Holland next month. So here is a quick tour. Photos appear a little farther down after an initial description. It is one of most interesting and comfortable of the homes my Peace Corps colleagues are occupying throughout Namibia. I feel very lucky to have this particular dwelling. There are many PCVs (Peace Corps Volunteers) with more modern housing, some including washers, some are air conditioned, and many have drywall or stone construction and would feel at home in any modern US city. Some of the PCVs live in mud huts with no running water, electricity, or indoor toilets, not to mention no internet! The common phrase associated with my home is that is provides a real “Africa Experience”. And that it does. And it’s roomy – a real luxury. While it has been occupied over the years for brief periods, and spent major time as a storage building, it is turning into a genuinely welcoming residence and home. The floor (tile) was replaced just a month or so before my arrival in anticipation of long-term occupation. The window is just above the kitchen sink/counter. The door has “burglar bars’ as a gate. Steps leading off the picture to the right lead up to the rest of the Penduka compound that I’ll cover in a future blog. The orange LPG tank feeds my range/oven and there are a couple of mosquito net frames next to it that I’m messing with to try and put netting on the windows. The bugs can be a problem here in the summer (Sept – March. Southern Hemisphere). Incidentally, Malaria is not a concern in the Windhoek area and southern Namibia, so I don’t need to take Malaria prophylaxis or sleep with mosquito netting around the bed as I did in Okahandja, about one hour drive north. My bed is in the back right corner, and just five days ago the couch/fold down bed (for guests) was delivered, and is just at the bottom of the picture. The steps to the loft are on the left, and I turned the area under the stair landing into a “closet”. The wicker shelf units (right side and back), and the bureau on the right, were put in the building just before I arrived. They are in pretty rough condition, but serviceable, and I’m very fortunate to have shelving at all! This is my desk, with temporary desk lamp deliberately left pointing into the camera for “artistic effect” (ha!). I bought a desk chair since I’ll be spending a LOT of time working at the computer at the desk, which is actually a small dining table with a student desk from a nearby school set up for the laptop. This is a good view of the stairs to the loft. I could put my bed in the loft, but it is likely to get really hot up there in the summer. Now we walk over to the desk, at my chair, and look towards the front (south) of the building into the bathroom. Note the refrigerator on the left (the kitchen area). The toilet is just to the left of the shower behind the wall in the center of the photo It’s pretty exposed at the moment, but the craft shop is making me a batik curtain to hang at the entrance to the bathroom. That should be finished next week. Note the stack of papers on the desk – this job is already very involved. More on that in a future post. The refrigerator and gas range/oven are on the right, window with a view of the lake is just above the sink,and the door on the left. I’m extremely fortunate to have a gas range/oven! There was no range or oven in the building when I arrived and I was planning to get a small countertop unit that has two electric burners on top and a “toaster oven” below them. BUT, when I was visiting the TB Program office with Penduka, they had a brand new but two year old unused gas range/oven sitting in the corner they didn’t need, so they gave it to me! I bought an LPG tank and some hose, punched a hole in the wall for the host so the gas bottle would be outside, and now I have an absolutely fabulous five burner gas range with a full size oven! And I love to cook! Omg. Final view is of a Batik Apron the craft shop gave me, and which I use as a wall decoration at least temporarily. This is made here in the Penduka Craft center as part of the operation I am working with. I’ll also have them make a large Batik “curtain” to hang around the “bedroom” area to provide privacy for me and for a possible house guest staying on the couch. I love this place. Friends who have visited have said it just seems perfect for me, and I agree. I’ve only been here five weeks, and it feels very homey – with more to come. 008 What is happening to me, anyway? Having been on site for a month, and in Namibia just over three months, I’ve come to understand this most recent life transition as simultaneously a great adventure and as a “life as usual” continuation of the previous 65 years of my experiences. The differences between Namibian culture and the cultural expectations built up from my own lifetime are sometimes very subtle, sometimes non-existent, and sometimes blatantly obvious. Often, even usually, they can provide an easily and unconsciously accepted excuse to not take the trouble to understand what’s going on, or even to see what’s there instead of perceiving what is actually there. It is so easy to simply say “it’s a cultural thing.” There are some of those, of course, and I’ll mention them off and on as I write these blogs. I hope to stay focused on “The Experience” in its raw form, and not classify it. Anticipate a number of failures on my part in fulfilling that intent. “People are fundamentally alike wherever they are. If we can connect with those similarities, and also accept the cultural actions that make us communicate with them differently, we have some chance of integrating into the community and expanding our perceptions.” That’s pretty much it – but I also stand by the first paragraph. I could go on, and already have (lol). Since arriving, my attention has been on getting inside of this most recent experience and I let my communications activities outside of Namibia slip. The frequency of postings to this blog has not been as satisfying to me as hoped for, and I’m betting the same is true for a number of my friends. I would ask you to consider the same attitude I’ve come to accept: sometimes I have to be with an experience and not attempt to translate it. Frankly I think (until now) it’s been helpful to not try and sort it all out into words and simply be with the day to day thoughts and experiences. That doesn’t do you, the reader, much good but there it is. Increasingly over the past couple of weeks I’m shifting that to the equally valuable need to put things into words. Never having adapted writing as an avocation, let alone a vocation, it’s not a natural thing for me to sit down and just write. Frankly it’s also a little frightening. “Putting it out there” creates the opportunity for rejection, negative criticism, no reactions at all (which feels like the worst to me), and all those other scary reactions. I have to laugh as I write this, as true as it is, since it comes from the same guy/author who deliberately took up acting as a way to take more risks with facing the world borne of an intense desire to connect with people. Ah, such is the paradox of attempting to live an aware life. I hate it when that happens. An increasing appreciation for true friends is becoming more and more a part of my daily life, here. I have made friends in my USA life that live within me moment to moment, every day here on my own in Africa. It is an amazing thing to my particular personality that these friends will “forgive” my communications absences and still be around when I show up, or respond to their reaching out. It may be hard for some of you who have a close family and life history of developing and nurturing friendships to really get the degree to which you are a treasured part of my expanding life. I am immensely grateful for the warmth of my dock community in Sausalito, the enduring personal relationships developed in Marina del Rey and the Los Angeles area, the sporadic contact with persistent friendships from Dallas when I was a young man, and the often neglected friendships and acquaintances made in the decades between Dallas and Namibia. There is a sense of sorrow about lost opportunities in the latter case. I suppose there is value in both: moving on in life while staying in touch with a few friends, and in settling with a community and valuing their physical presence for an entire lifetime (ie: not moving). Occasionally, but with regularity, I am approached by someone here in Namibia to give them money. The belief that people from America (and from Western Europe) are rich is prevalent and very fundamental, here. I can argue persuasively, and accurately, that I’m only “getting by” (not too badly) in the United States. But the truth of the matter is that, compared to the vast majority of the people here in Namibia/Africa, I am enormously wealthy. I’m talking about money, not just in the inner wealth so easily attributed to the concept of wealth by people involved in personal growth and “new age” appreciations. A high bar in terms of economic wealth is so taken for granted by the majority of people in the USA that it is a completely different world than is experienced here. Even people in the USA who are “low income” (not all, some) would have a hard time relating to the standard of living here. With the income disparity in Namibia being one of the worst in the world, I have seen, and experienced, the fact that opportunity to improve their lot in life for the majority of the people here simply does not exist as a practical reality. Sure, there are always a few people that do manage to “break out”, but they are the rare exception (as they are anywhere). And forgive my presumption for a moment, but those of you who feel that is BS, that people can always move ahead if they really want to, simply do not know what many folks in the world live with day to day. That judgmental evaluation of opportunity for all (if they only really wanted to do something about it) comes from lack of education of what is very, very real for many people. What I’m trying to convey is that the NORM here is serious poverty – so much so that it doesn’t even seem like poverty to those people living in it. All of us, myself included, have extreme difficulty really seeing outside of our experiential filters. That doesn’t mean our view is true, or even valid. It only means it’s our view. And the view of people here is limited, and it’s impacted their fundamental understanding of their possibilities in life for many, many generations. That subject seems like, and in some ways is, a detour from the focus of this post. But not really. Learning how to be in a completely different culture is absorbing, the subtleties are easily overlooked, and the changes in my perceptions and attitudes are easily missed because they come slowly. I have found it difficult to continue to understand, to change myself, and to adapt when faced with a need to put into words forces and observations that I barely perceive or understand to begin with. For some reason, that is changing also. I hope to put up more posts and take more risks. Let’s just say I am beginning to understand why a Returning Peace Corp Volunteer finds the re-integration into the USA culture even more stressful than adapting to their new posting when first starting a Peace Corps assignment. Predictably, contact from my friends in the USA have also decreased undoubtedly because while I respond almost always, I’m not pushing from this end. Life can so get in the way and cause friendships to dissipate. It gets lonely here, particularly for a personality that craves attachment as I do. Real friendships will (and are) developing here in Namibia, but it will take some time. 028 – Finally, a new blog. So what am I doing now? 025_Back from Vacation, and matching donations now possible!